Carlisle boss Keith Curle is confident he has found the areas his side need to improve in to avoid a battle against League Two relegation next season. The Cumbrians are currently 20th in the bottom tier, but nine points clear of danger with one game to play. Curle took over at Brunton Park in September with the club bottom of the league and guided them to safety. 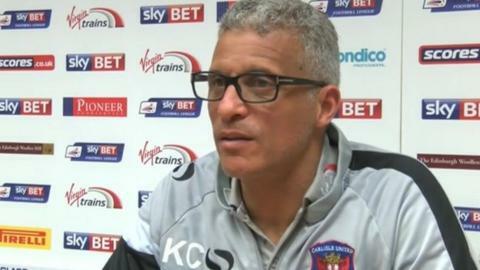 "I know exactly what's in that changing room and what's needed going forward," Curle told BBC Radio Cumbria. "I came into the football club with an open mind, there's a large amount of things I'd do differently with the benefit of hindsight." Despite his success in avoiding the drop, it has not been a simple task for 51-year-old Curle who has had his issues with members of the squad. Billy Paynter and Gary Dicker had sought advice from the PFA players union in February after a disagreement over training schedules that has now been resolved, while Curle's outburst at "weak performances" after a disappointing five-game winless run toward the end of the season highlighted his frustrations. Player movement is expected once the campaign comes to a close, as the former Notts County and Chester boss prepares to take on his first pre-season at the club. "[There's] a lot of work [to do this summer], the important thing is to finish this season," Curle added. "Tuesday is when we can close the door on this season, then we can look ahead to next season. "Players have contracts, we're an honourable football club and the players will be paid. "The important thing is you identify the players who don't have a future, and have an honest dialogue. "Players are here for a reason, they're here to play football and what we don't want is players here paid not to play."